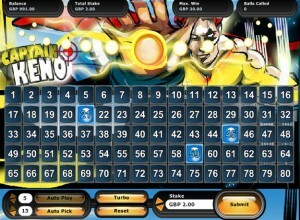 Captain Keno - Review before you play at Lord Bingo! The game is fun to play and there is loads of money to make from playing the game. The grand graphics and the outright realistic sound effects make the players playing the game more attached to it. To play the game a player buys a stake into the game for as little as £1 or as much as £10. Each of the stakes one buys permits them to get extra numbers, although the maximum number allowed is fifteen. The Captain Keno game has cannons that the player uses to fire at a series of balls. When a player hits a maximum of ten numbers they get the maximum payout. A useful Captain Keno tip If a player selects very few or at other times many spots, the spots can negatively influence the chances of getting a good pay day. It is essential that a player doesn't pick the maximum or least quantity of spots, unless they really have to do so to minimize their chances of winning a progressive jackpot. To have better chances of winning it is prudent that a player selects seven, eight or nine spots to have a good chance of winning. Captain Keno is one of the oldest online casino games and has withstood the test of time, as the chances of winning when someone is playing the game are many. Players simply choose their numbers and hope that they will come up when the virtual balls are drawn. Playing Captain Keno online has its benefits, one of them being that a player cannot get addicted to it and they can disengage from it when they wish. Playing the games is just like picking lotto numbers. The game depends on luck and even a first time player can win, based on how lucky they are. The more a person familiarizes themselves with the diverse rules on how best to play Keno game, the more the game becomes enjoyable and interesting for them.